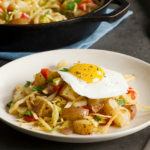 Serve this hearty and healthy hash for breakfast, brunch or dinner. Hash: In large skillet set over medium heat, heat oil and butter; cook potatoes, onion, red pepper, celery, garlic, salt and pepper, stirring occasionally, for about 5 minutes or until slightly softened. Add cabbage, Cajun seasoning, thyme and chili flakes; cook, stirring occasionally, for about 5 minutes or until potatoes are golden brown and cabbage starts to wilt. Add broth and Worcestershire sauce. Reduce heat to medium-low; cover and cook for about 10 minutes or until potatoes are tender and most of the liquid evaporates. Stir in parsley. Fried Eggs: Melt butter in nonstick skillet set over medium heat; break eggs into skillet. Season with salt and pepper. Cover and cook for about 3 minutes or until egg whites are just set for sunny-side up or cook until done as desired. Divide hash among 4 plates. Top each with fried egg. Serve with poached eggs instead of fried eggs if desired. For vegetarian hash, substitute vegetable broth for chicken broth. For indulgent hash, add bacon to hash.